Anyone can understand the grief and desolation felt when a loved one dies. But what about the crushing hurt and uncertainty when somebody just disappears? Hundreds of thousands of people are currently missing around the world from armed conflicts, violence, natural disasters, or migration. Whether it is combatants missing in action, children separated from their families when they flee or are forced into armed groups, detainees unable to contact their families, or internally displaced people and migrants who have lost touch with their loved ones, many are at risk and disappear every year. Chechnya, Russia, 2014. 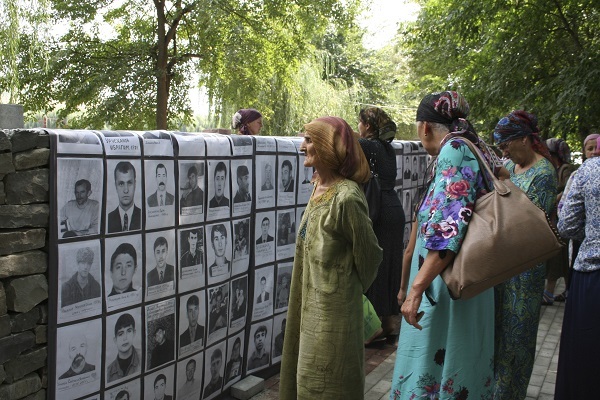 Families of the Missing look at pictures of their relatives who disappeared. The full scale of the problem is unknown and chronically unacknowledged. If alive, missing people need to be located and protected. If dead, remains must be searched for, properly handled, identified where possible and returned to their loved ones. But the political will to properly document and tackle these issues, and to support the families in their plight, is often sorely lacking. No one can doubt the pain felt by relatives. Not knowing if their loved ones are dead or alive, they are left in limbo. Many search in vain for answers for years, unable to resume their lives. And besides the emotional trauma, there are very practical consequences for those left behind. Can members of the family access social benefits, sell property, or remarry, without legal recognition of status? If the missing person was the breadwinner of the family, how will the family now earn an income? The ICRC does what it can to help. But it is vital that governments and others step up their efforts to relieve the suffering of so many people and to address one of the most complex, challenging and under-reported humanitarian problems in the world today.